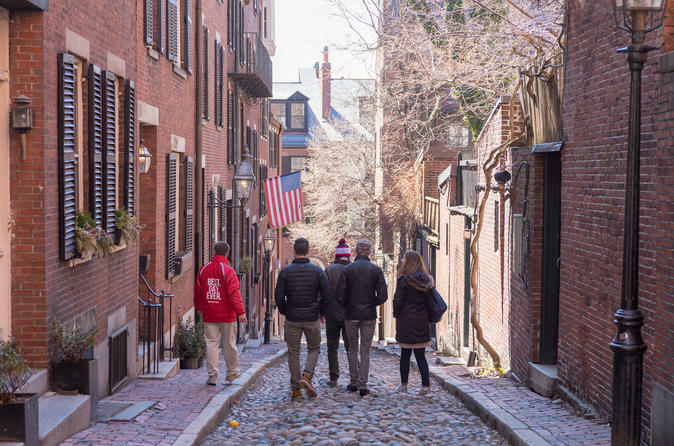 Your North End to the Freedom Trail combines our North End Food Tour and our History and Highlights Tour to make up a brilliant half day tour that will give you a comprehensive introduction to our fair city. We will begin at the lifeblood of Boston, the Boston Harbor with a walk through a scenic waterfront park. We’ll make our way to the heart of the North End, with views of some of the most historic sites. Tasty food is never far away in the North End. Your guide will introduce you to a small, hidden Italian bakery serving up fresh bread daily. A proper Italian salumeria is next, where you’ll have a chance to enjoy some Italian meats and cheeses. Next up, we’ll take in the energy of the North End’s busiest corridor, Hanover Street, where it’s time for a mid-tour break with your guide at a traditional Italian café. You’ll hear stories about some of the most influential events that happened in Boston, including Paul Revere’s Midnight Ride. We will make our way to the Old North Church and step inside the hallowed walls. A taste of pizza awaits at a neighborhood favorite and then we’ll cap off the North End food experience with samples of the best Italian pastries along the back streets of this delicious neighborhood. Continue on with your guide beyond the North End neighborhood for a leisurely stroll through some of Boston’s best markets and green spaces. You’ll begin the second part of your journey back at the Aquarium “T” Station where we’ll meet more members of the group. From the Harbor, we’ll continue past the Rose Kennedy Greenway, State Street and the historic Custom House Tower, the city’s first skyscraper. Then, your guide will lead you toward the famous Faneuil Hall and Quincy Market. Moving into the heart of Downtown Boston, we will stop in front of the Old State House and site of the Boston Massacre. Was it really a massacre or maybe just great propaganda for the Revolution? A short trek through Downtown Crossing and past the Old City Hall will take you to one of the most historic places in the country, King’s Chapel Burial Ground and King’s Chapel. Somewhere along the way during this tour, you’ll have a chance to rest your legs and enjoy a refreshing local beer. On most weekdays, you’ll have a chance to see the government at work (or not) inside the inspiring, historic, and beautiful Massachusetts State House,. Outside the State House, take in the views of modern Boston, including the skyscrapers of Downtown, the Financial District, and the tallest building in New England - the John Hancock Tower. We continue our journey through Beacon Hill, where you’ll have a chance to take in the quintessential architecture of Boston’s red brick row houses. Finally, we’ll arrive at the beautiful Boston Public Garden, one of Boston’s favorite green spaces, where you’ll see locals walking the dogs, playing with the kids and enjoying lunch in the shade.